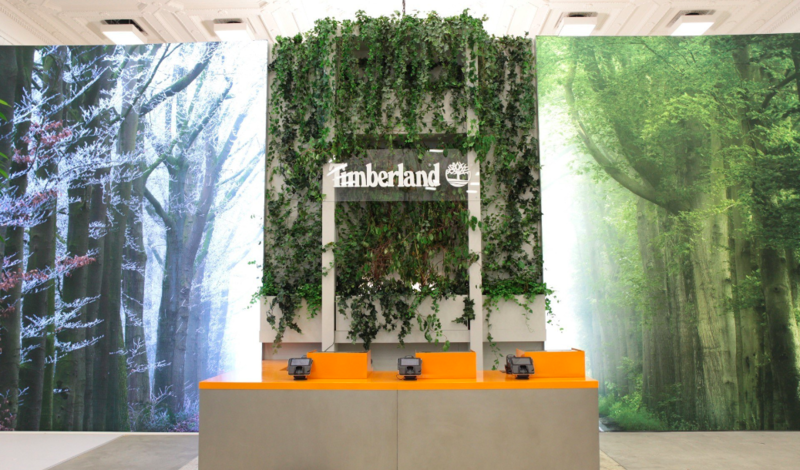 Timberland opened the doors to the company’s first experiential pop-up store on New York’s famed Fifth Avenue, at 43rd Street. The concept store reflects the brand’s 45-year heritage through the lens of nature–living trees, natural earth terrariums, an over-sized living green wall–and experiential weather moments to inspire the community to embrace the outdoors in the city. The 3,500-square-foot space at 511 Fifth Avenue is a bold expression of Timberland’s brand purpose, calling on a generation of city dwellers to step outside. Upon entry guests are immediately transported into the outdoors, and the deep New England roots where the brand was born. Ten full-sized, living birch and ficus trees deliver the first moment of bringing the outdoors in. In line with the brand’s longstanding commitment to urban greening and tree planting, the trees will be donated and given a permanent home in New York City later this fall. Amid the trees, natural earth terrariums comprised of ferns, moss and other native New England plant species lead consumers along their retail journey, while a majestic living green wall, featuring nearly 2,000 plants, blends with the stone architecture for a uniquely modern take on the outdoors. Engaging weather experiences–including an interactive digital rain room and a blustery, photo-ready winter scene–encourage guests to embrace the outdoors, knowing they are protected from any elements Mother Nature throws their way. Key product collections, reflecting Timberland’s longstanding heritage of waterproof protection, warmth and style, are paired with each of the experiences. The fixtures in the space seamlessly blend with the environment while also making a statement. Bespoke reclaimed natural wood and metal table tops, custom benches and rails, are on loan from Cleveland Art, while stunning landscape photography created by Dutch photographer Albert Dros dons the walls. From the street, passers-by have an open view into the store environment via eight floor-to-ceiling windows that are adorned with modern graphical expressions of nature’s elements: wind, water, earth and sky. Timberland on Fifth Avenue opens with a curated assortment of the brand’s pinnacle fall ’18 collections, including special releases and designer collaborations, men’s and women’s outerwear and accessories for the cooler months ahead. Special attention is given to the Timberland Boot Company and American Craft collections, which represent the brand’s benchmark of modern craftsmanship and style. The store’s prime window real estate, at the corner of Fifth Avenue and 43rd Street, features a dedicated women’s area, beautifully showcasing the fall women’s collections, including the new Sutherlin Bay and Courmayeur. Timberland will celebrate the Fifth Avenue opening with a series of events starting October 16, including a larger-than-life Timberland Classic Boot and pop-up park in the Flatiron District, an Urban Greening event at the Thomas Jefferson Recreation Center in Harlem and a private VIP launch event. The celebration will culminate with a day-long celebration at the store on Friday, October 19, which will be open to the public and feature product giveaways, crafting stations, entertainment and more.